On Monday, the New York Times published a story detailing a multi-million dollar ad campaign launched by Starbucks in which the company put up advertising posters in six major cities and attempted to “harness the power of online social networking sites by challenging people to hunt for the posters on Tuesday and be the first to post a photo of one using Twitter.” Those who posted the pictures to the microblogging site were to use predetermined hashtags that were listed in the contest rules. Unfortunately for Starbucks, liberal activist and filmmaker Robert Greenwald, founder of Brave New Films, came across that Times article early Tuesday morning. 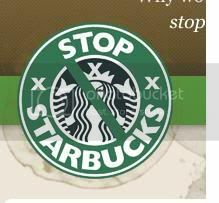 Greenwald, who has directed films for major studios and launched Brave New Films a few years ago, had been working for months on shooting an anti-Starbucks video that debuted on YouTube that very day. 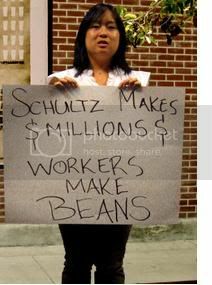 The mini-documentary features interviews with several former and current Starbucks employees and makes the argument that the company — despite popular perception that it treats its employees well — has unfair labor practices and has aggressively fought off union organizing. On a blog post published at the anti-Starbucks website Brave New Films created, people were encouraged to take pictures of themselves in front of Starbucks stores holding signs targeted at the company’s “anti-labor practices.” These users are then told to upload these photos onto Twitpic and tweet them out to their followers using the hashtags #top3percent and #starbucks. According to the post, these are the official hashtags that were designated by Starbucks itself for those who wanted to enter its contest. Within hours, several people had followed these guidelines and there were dozens of Twitpics in front of stores across the country. As of this writing, the anti-Starbucks YouTube video has amassed over 30,000 views and was featured on the front page of social news site Digg. Greenwald said that Brave New Films is not done with its offensive against the coffee company, but he was hesitant to reveal his next steps. Given that the the filmmaker was able to take Starbucks’ own Twitter marketing campaign and turn it against it, I asked Greenwald what this means for corporations dipping their toes in social media marketing.